The faint, ephemeral glow emanating from the planetary nebula ESO 577-24 persists for only a short time -- around 10,000 years, a blink of an eye in astronomical terms. 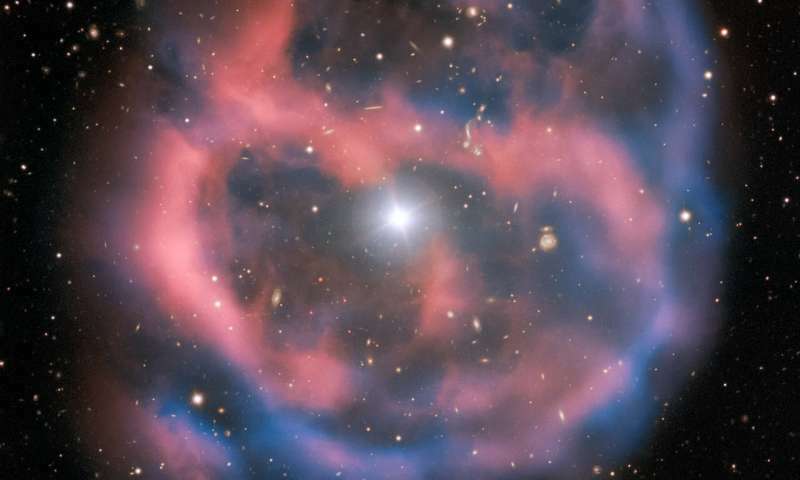 ESO's Very Large Telescope captured this shell of glowing ionized gas -- the last breath of the dying star whose simmering remains are visible at the heart of this image. As the gaseous shell of this planetary nebula expands and grows dimmer, it will slowly disappear from sight. This stunning planetary nebula was imaged by one of the VLT's most versatile instruments, FORS2. The instrument captured the bright, central star, Abell 36, as well as the surrounding planetary nebula. The red and blue portions of this image correspond to optical emission at red and blue wavelengths, respectively. The faint, ephemeral glow emanating from the planetary nebula ESO 577-24 persists for only a short time—around 10,000 years, a blink of an eye in astronomical terms. ESO's Very Large Telescope captured this shell of glowing ionized gas—the last breath of the dying star whose simmering remains are visible at the heart of this image. As the gaseous shell of this planetary nebula expands and grows dimmer, it will slowly disappear from sight. An evanescent shell of glowing gas spreading into space—the planetary nebula ESO 577-24—dominates this image. This planetary nebula is the remains of a dead giant star that has thrown off its outer layers, leaving behind a small, intensely hot dwarf star. This diminished remnant will gradually cool and fade, living out its days as the mere ghost of a once-vast red giant star. Red giants are stars at the end of their lives that have exhausted the hydrogen fuel in their cores and begun to contract under the crushing grip of gravity. As a red giant shrinks, the immense pressure reignites the core of the star, causing it to throw its outer layers into the void as a powerful stellar wind. The dying star's incandescent core emits ultraviolet radiation intense enough to ionise these ejected layers and cause them to shine. The result is what we see as a planetary nebula—a final, fleeting testament to an ancient star at the end of its life. This dazzling planetary nebula was discovered as part of the National Geographic Society ?—?Palomar Observatory Sky Survey in the 1950s, and was recorded in the Abell Catalogue of Planetary Nebulae in 1966. At around 1400 light years from Earth, the ghostly glow of ESO 577-24 is only visible through a powerful telescope. As the dwarf star cools, the nebula will continue to expand into space, slowly fading from view.